Good morning everyone! Aren’t you so glad 2016 is over and 2017 has begun? I sure am. And I’m looking forward to this baby being born in a few weeks! Today I have some swatches and nail art with Ever After Burning Twilight, Grace-full Mango Sherbet [Hella Holo Customs], and Pahlish My Bespoke Psychopath II. Ever After Burning Twilight is a holographic periwinkle cream base with gold, bronze, and pink flakies. Formula was a good consistency. This is 3 thin coats plus top coat. I then used nail vinyl swirls with Grace-full Mango Sherbert and Pahlish My Bespoke Psychopath II on my middle and ring fingers. I had to show off how gorgeous this looked in the sunshine! I loved how this turned out, all the colors really meshed well together. What are your thoughts? Really nice hypnotizing design that is. Love the look of that base polish too. This is stunning! 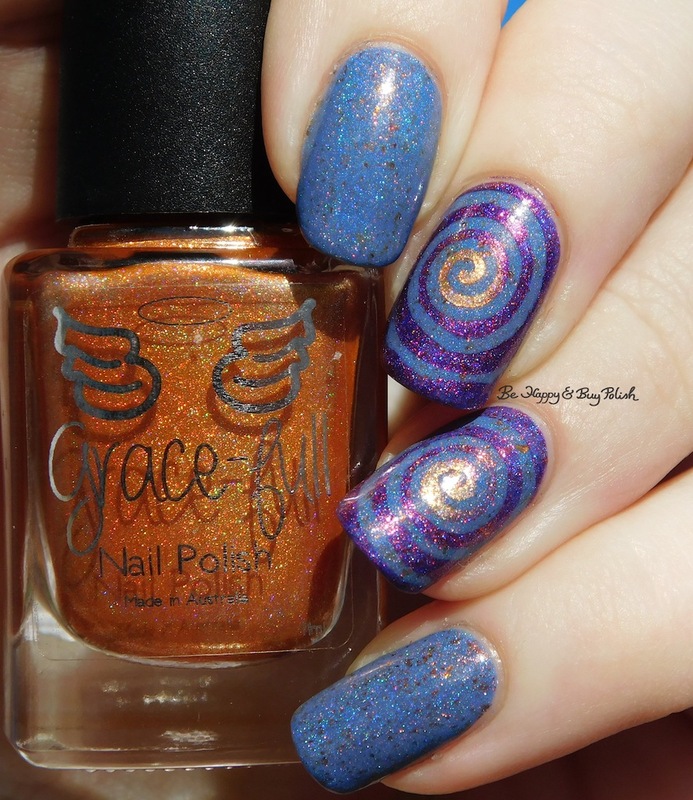 I love the blend of polishes for the swirl. That Ever After is SO STUNNING!